I am growing 4 Habenero Plants but they are not fruiting. 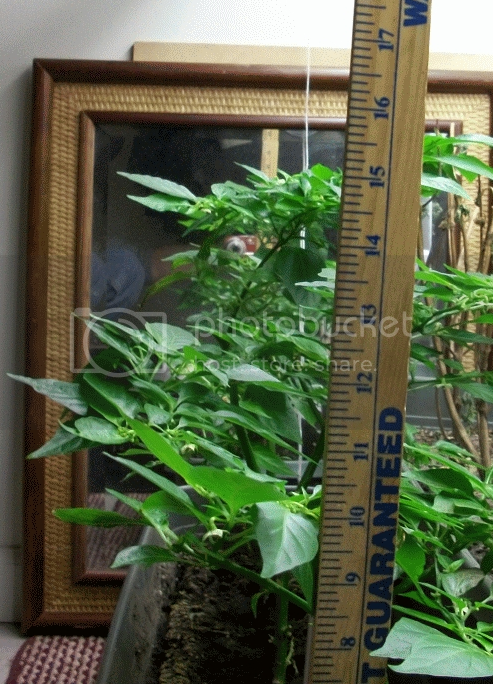 I have lots of buds, flowers and leaves but no peppers I moved it indoors in October 2010 several weeks before the frost. It was fruiting prior to the move while it was in the garden. It isn't popping off peppers now, though. Several weeks ago I had to trim the plant because it was forming sort of a dense, flat forest canopy with TONS of flowers and I read that too many flowers will compete to fruit, so I trimmed the plants to preserve about 5 flowers per plant - oh and the flowers grow facing downward. I've tried pollinating the flowers weekly with a small paintbrush, but so far, no peppers. Now, the plant is growing even more buds, despite my trimming and I can't keep up with the flowers. Also, I added some miracle-gro around the time I moved it indoors and recently about a month ago, according to the directions. I'd really like to grow some herbs in the other pot, but the basil died in the other pot and I'm leary to try that until I understand what is going on. 20" above plants in a 4' fixture. There is no sunlight, hence the 15 hour fluorescent cycle. Soil: Sterilized Compost, potting soil, garden soil, and vermiculite. Gravel in tray to capture extra water. Pot: 8" deep, 3' long. You might over thinking it...just let the plant do it's thing. I don't think all the trimming is helping and have never heard / am not sure I would believe that too many flowers is a bad thing in relation to getting pods. (1) Haven't tried Habs but Jalapeno's and Sw. Peppers -- pollen need not move from one flower to another, just jostle/shake the stems with flowers so pollen transfers from male part of flower to female part. 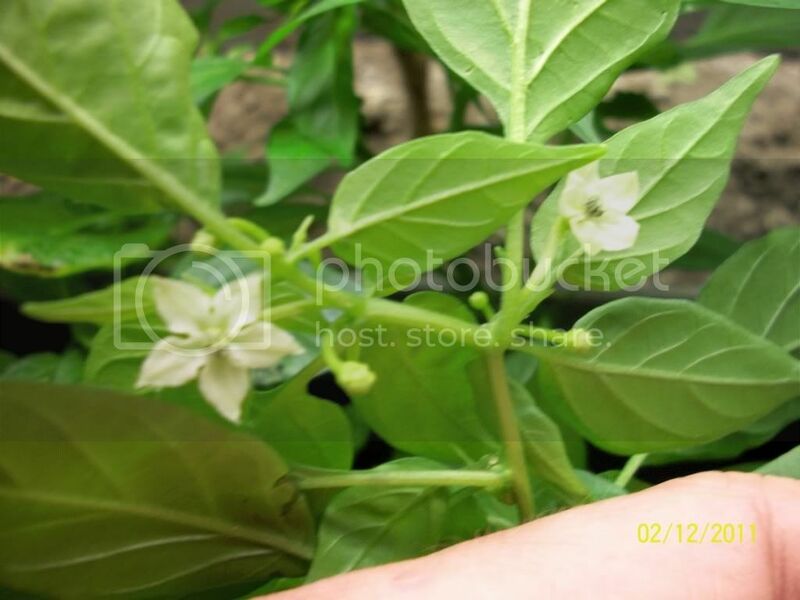 (3) Can't go get the link now but look in Bonsai Forum for "How much flower/fruit can be supported?" thread. I got some good advice. (4) If straight Miracle Gro and not Tomato, probably too much Nitrogen in the mix. I just came home with Espoma Tomato Tone and Dr. Earth Tomato and Veg organic fertilizers to try this year. Don't know if this applies or not. But I had a jalapeno plant last year that got flowers and was growing like gangbusters but never got any peppers all summer long even though the plant otherwise looked fantastic. I did some reading and found out that an overabundance of nitrogen can cause this. So if you are fertilizing, stop. It might be the problem! Side note, my plant was potted. And after a full summer of nothing but leaves growing, it finally started to get peppers in oct and continued through dec! In retrospect, I think it is because the plant finally ate through the nutrients in the soil and brought it down to a normal/suitable level. Too much nitrogen will cause plant growth (leaf) but may reduce flowering or fruiting. Ok, I need to bring the Nitrogen level down some. Can I add something to the mix to reduce Nitrogen? Also, are there any good testing supplies to measure the soil pH? csvd87: That is a great idea with the electric toothbrush! Maybe just changing out the soil would be a good idea instead of trying to add and subtract. Just a suggestion.